Live high above the Texas Hill Country in Mirabella, an exquisite new custom home collection in the master-planned community of Travisso. Tucked in among rolling hills, Travisso’s ideal location (only 30 minutes from downtown Austin) offers spectacular views. Where dramatic sunsets and gorgeous sunrises are daily occurrences Travisso’s hillside splendor demands bragging rights. And, there’s good reason why. Its natural surroundings are simply beautiful. 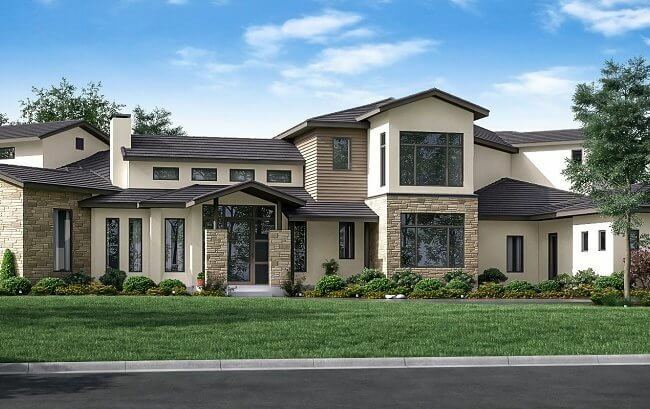 Mirabella is set to make its grand entrance this fall during the 2018 Parade of Homes. During this prestigious public event tour Mirabella and one-of-a-kind statement making residences by four area premier custom home builders. But, before you tour their homes, we’re providing you with some background information on each one. For a truly one-of-a-kind custom home, Aluxa Homes will take your sketches and ideas and transform them into reality. After all, customizing your vision, is their true passion. And, when you build an Aluxa Home there are no limitations. In other words, the sky’s the limit. 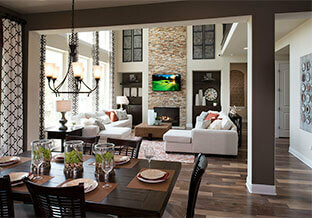 At Aluxa Homes you can choose your own layout, design, and selections. Begin completely from scratch. Or, start with one of over 100+ floor plans and modify it to fit your family’s lifestyle. Aluxa Homes offers three collections: Platinum, Gold and Silver. Aluxa Home’s impeccable craftsmanship and over-the-top details are top-notch. However, what makes them stand-out from other builders of the same caliber is their unique business style and formula for success. After you sign a contract with them you become their partner. In other words, you’re part of the family. And, there are multiple benefits to this arrangement that include transparency, trust, value, and fairness. Their no “hidden cost” guarantee is another benefit. The company accomplishes this through a detailed design and estimation process that takes place pre-contract. As a custom home builder and renovator Glazier Homes takes pride in designing homes that reflect their client’s personality. But, it’s their unique style—a mix of comfort and craftsmanship that they transform into timeless elegance. At Glazier Homes whether you like traditional, contemporary, or modern farmhouse when you choose your plans there are options. You can bring your own plan, design it from scratch, or choose a pre-existing one. The company offers seven pre-existing floors plans for homebuyers that prefer to have a starting point. One and two story home sizes range from 2,000 to over 5,000 square-feet with a multitude of choices in between. Modifications are welcome. From custom exteriors to interiors Glazier Homes is known for their superior quality. However, it’s the special touches such as spiral staircases, wood beams, oversized window escapes, and swank lighting that make their homes extraordinary. Don’t want to get lost in the shuffle? No worries. Glazier Homes assures each project’s success by following a nine-step process created by owner Jared Glazier. As a luxurious home builder, Hill Country Artisan Homes exceeds their customer expectations. A Hill Country Artisan home is all that you expect—open spacious designs and flexible layouts. And, of course more—extraordinary features and exquisite designs for less. But, there’s no need to compromise. To ensure quality and value the company provides prospective clients with a portfolio of pre-existing floor plans. According to their website, this helps to simply the home buying experience. And, it helps to streamline the process by keeping clients focused on choosing exterior and interior design selections. Their impressive portfolio is a collaborative effort of some of Texas’ finest architects and reflects the needs and wants of today’s homebuyers. Pre-existing floor plans can be modified and customized to meet your personal style. Established in 2016, under the brand Pacesetter Homes, Hill Country Artisan Homes owner and operator is Canadian-based Qualico. It was formed to meet the needs of the custom home market in Texas’ hill country. The foundation of Vogel Builders is their reputation for building high quality homes while committing to excellence. A skill that owner Eric Vogel learned while wearing several hats working for Houston-based Perry Homes. Both inside and out, Vogel homes are meticulously designed and constructed offering a multitude of amenities. If you dream it, Vogel Builders will build it. Customers have the choice of building on their own property or selecting one owned by Vogel. An extensive selection of stylish home plans are also available. Or, bring your dream home ideas to the first meeting and they’ll help make your dream a reality. According to their website, nothing is off limits and everything is custom and customer specific. In addition to building dream homes to their client’s specifications and satisfaction Vogel also remodels existing rooms and homes. Vogel Builders continues to strive for excellence. Another reason why they won two 2018 MAX awards. One, for the “Best Remodeled Project.” And, another for the “Best Outdoor Living Remodel.” The Home Builders Association of Greater Austin (HBA) presents the awards annually recognizing the best of the best in home builders, developers, remodelers and associate members. Tour all four homes and more this fall at Travisso, this year’s site of the 2018 Parade of Homes, Oct. 19 through Nov. 4. This open to the public annual event is a mecca for all the latest and greatest in home construction, interior designs and trends, landscaping, and much more. And, one event you won’t want to miss. Purchase your tickets now by clicking here. The HBA of Greater Austin sponsors the Parade of Homes.